NEW BRITAIN - After reeling off four straight wins, the CCSU women’s basketball (6-20) team has now lost three straight with the 67-51 loss to Robert Morris on Monday. It started out bad as the Colonials (21-6) began the game on a 12-0 run. The Blue Devils would answer right back with a 12-0 run of their own. Down just five points coming into the second half, CCSU was outscored 17-9 and the 13-point deficit going into the final period of play was too much for their offense to overcome. The Blue Devils shot 35 percent from the floor and their starters scored just 19 points in the final home game of the season. Emma McCamus and Sydney Hines combined for 23 points off the bench for CCSU. McCamus’s 13 points were a career high for the freshman. While there was a lack of offense, the Blue Devils knocked down 10-of-13 at the foul line as a bright spot. CCSU is in a three-way tie for seventh place in the Northeast Conference with a 6-10 record in it. 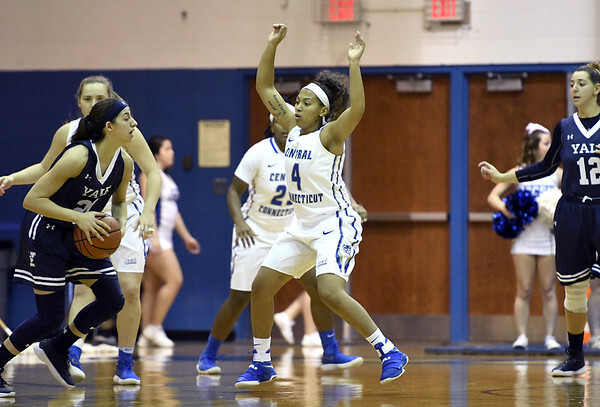 The Blue Devils have two games remaining on their schedule, on the road at St. Francis Brooklyn Friday night at 7 p.m. and LIU Brooklyn Sunday at 2 p.m.
Posted in New Britain Herald, CCSU on Monday, 26 February 2018 22:40. Updated: Monday, 26 February 2018 22:43.